By Massimo Zancanaro on Tuesday, December 13th, 2016 in Blog, heritage, news. On the 5th and the 6th of December 2016, the University of Haifa held a workshop about technology of cultural heritage. It was organized in the context of bilateral activities between Israel and Italy and funded by Italian Embassy in Israel. The organizer, Tsvika Kuflik from the University of Haifa, is a renewed researcher in this field. I was honored to be one of the invited speakers as a member of the meSch project. The first day started with a speech of H.E. the Ambassador for which I was requested to wear a tie. The small discomfort was compensated by the illuminating words about the importance of cultural heritage in both our countries as an economic opportunity and also as a remind of how important is peace for the progress. Then, the rector of the university welcomed the participants and by chance his name is Gustavo … Mesch! No joke! His speech too was warm and profound. He spoke in Italian, a language he knows well since he was born and raised in Argentina in an Italian enclave. That was maybe a little bit inconvenient for the Israeli audience but I think that everybody appreciated the intention. Tsvika Kuflik from the University of Haifa, Oliviero Stock from FBK and Antonio Krueger, a special guest from DFKI in Germany, closed the morning with three visionary talks about the future of technology for cultural heritage appreciation. Myself presenting meSch project: the tie was already gone. 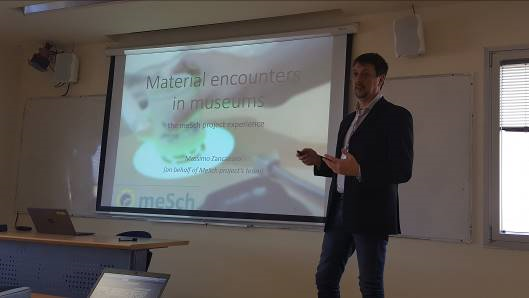 My talk was in the afternoon and I decided to present the meSch’s work as a double challenge. I wanted to share some of the great technological experiences created during the project lifetime (the Loupe , the Atlantik Wall experience and the Companion Novel at the Sheffield General Cemetery) but I also wanted to make clear that the ultimate goal of meSch goes beyond “yet another cool experience”. 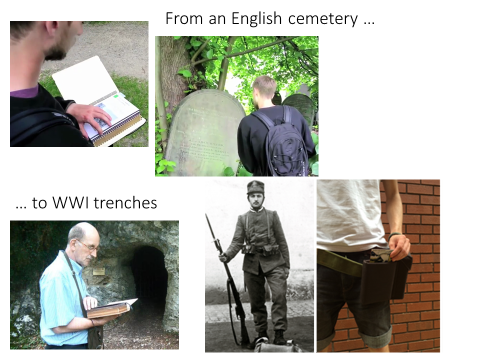 I tried to present the transition from book at the cemetery to the belt at the trenches (see figure below) as a key element of the meSch’s “authoring challenge”. Both experiences have in common the very same narrative structure and they are based on the very same appliance and script but instantiated in two completely different devices. The transition between the two exemplifies the two key elements of the meSch perspective on authoring: the separation of content from interaction and the “adoption and refine” approach (see our paper at M&W2015). For the rest of the workshop, I enjoyed the talks of many Israeli and Italian researchers and students who presented interesting and compelling projects. Overall, there were around 20 talks during the two days. The first day was closed with a great visit to the small but wonderfully curated Hecht Museum located inside the university where we enjoyed several demos of the ongoing local projects and we could appreciated Ma’agan Michael, possibly the best preserved Phoenicians ship in the world. The whole experience made me think about the importance of the technology research for cultural heritage and the importance of cultural heritage for the progress of technological research. We left with a “shalom” but it sounded more as an “arrivederci”.